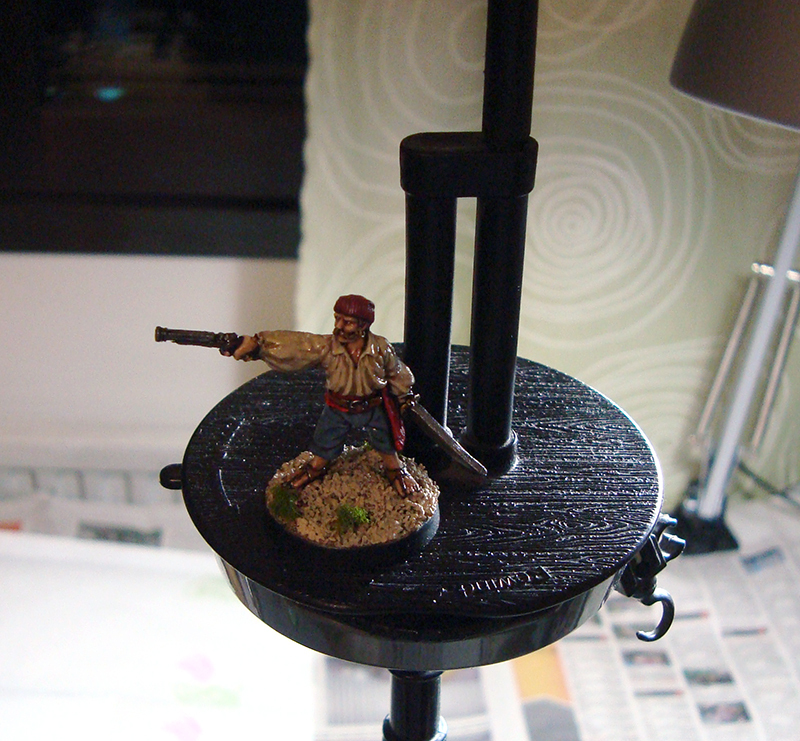 Salute 2015 sparked a huge interest in pirates in me. I was thinking of keeping it very low key – you know, a few packs of miniatures from Black Scorpion and Foundry, some pieces of special terrain, nothing major. 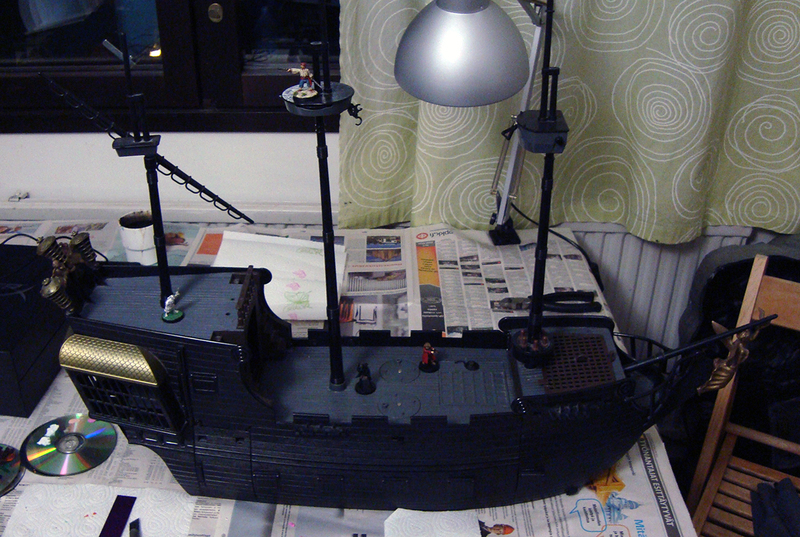 As these things tend to develop, yesterday evening I found myself in possession of a huge, 80 cm long pirate ship. 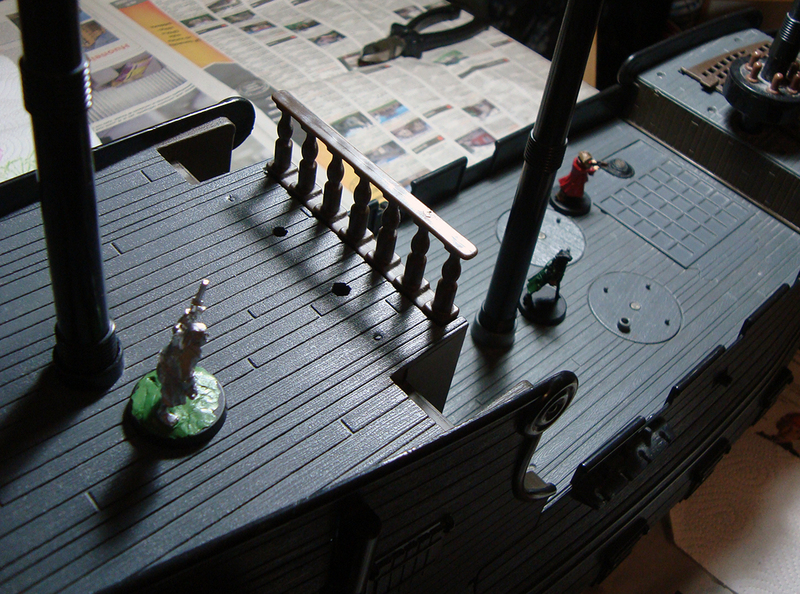 It’s the Black Pearl from the Pirates of the Caribbean movies, it comes from this playset and I got it for 30 EUR off a Finnish auction site. As I said and the pictures show, it’s a massive model, and I’ve no idea how I’m going to store it, but for now I won’t worry about it. Instead I’ll focus on the positive! There’s so much to love about the ship from a miniature gaming point of view. 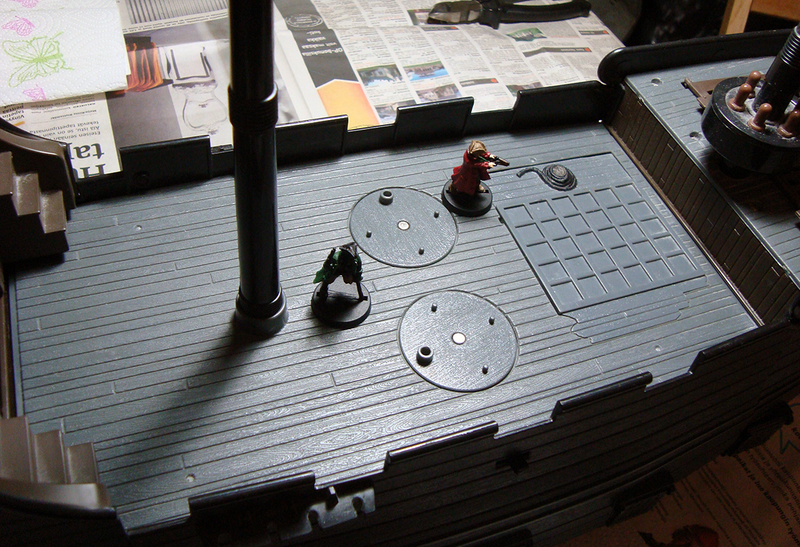 It’s magnificently scaled for 28mm, it’s nicely textured and has easy access to the ship’s interior. On top of that there are great toy functions such as a small soundboard and even flashing red led lights for the cannon. A piece of the ship’s prow also comes off, which will be a good way to show damage or to depict a beached ship. The ship will give me plenty of work. While the scale is good for the most part, it’s still intended for large action figures, so I’ll need to make doorways smaller, give the ship a smaller rudder, replace the cannon and so on. Some of the less detailed pieces will need a going over with coffee stirrers and some toy mechanisms will need to be removed. I don’t doubt that it will be a major task, but I’m still looking forward to it! To make my task easier, I’m going for a functional gaming piece and as said, I’m trying to keep many of the toy functions intact. This means I won’t go over the model, puttying over and sculpting every join and gap, nor will I add authentic rigging or anything like that. I know myself, and I want to actually finish this one! I’ll post updates on the blog as the thing progresses. While I don’t usually show a lot of work in progress stuff, I think that sharing in this case will be good for keeping up the morale (and the stamina). Hopefully this will also provide you with inspiration and entertainment! It goes without saying that feedback, ideas and experiences are warmly welcomed. I added some quick pics below just to give you an idea of the whole, sorry for the rubbish lighting and setup! All the minis are 28mm. I have one, a playmobile-like ship, and I work on it for a D&D/ Spelljammer board, cutting it in three horizontal parts, one for each deck, with rooms and squares on floor. I actually just bought a Playmobil ship today, as if this one wasn’t enough. I’d love to see pictures of the Speljammer ship! finishing the painting, and I post some pictures. Do playmobile ships work for scale? Cheers! There’s a fair bit of work involved, I think I’ve already put in 6-8 hours, and I’m just getting started.